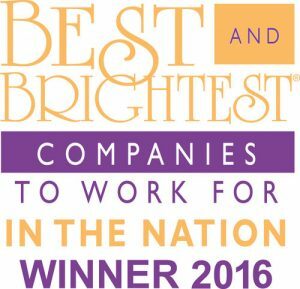 HomenewseventsStrive Consulting Named Best and Brightest Company to Work For in the Nation! Strive Consulting Named Best and Brightest Company to Work For in the Nation! We are very excited to announce that Strive Consulting has been named one of the Best and Brightest Companies to Work For in the Nation in 2016! This award comes from The National association for Business and recognizes organizations that “display a commitment to excellence in their human resource practices and employee enrichment.” Companies are critiqued on a variety of categories, including communication, work-life balance, employee education, diversity, recognition and retention. Over the past two years, Strive Consulting has been identified in multiple markets as being one of the Best and Brightest Companies to Work For. Strive Chicago has been recognized since 2015, Strive Dallas since 2016, and we are dedicated to having this same impact in Atlanta and Columbus in 2017. To be a part of Strive’s rising success, please visit our website for more information www.striveconsulting.com.